Fine dining, dry fly fishing and film star guests are de rigeur at this charming but homely boutique hotel. 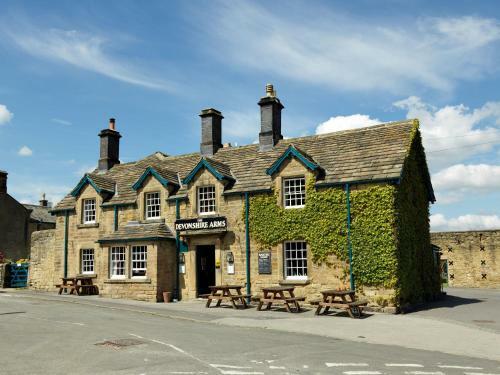 Set in the Peak District National Park, the Peacock at Rowsley is just a 5 minute drive away from Chatsworth House, Haddon Hall and the town of Bakewell. Sit in the cosy bar with its log fire and enjoy a generous gin and tonic garnished with a sprig of rosemary and slices of cucumber and lime. Dine in the restaurant with its distinctive Mouseman furniture and seasonal dishes. Then sink in to a supremely comfortable bed before drifting off into a deep and restful sleep. Mr Hendricks can come too because they simply love dogs at The Peacock. The Peacock at Rowsley was built as a Manor House by John Stevenson in 1652. Once the Dower House to nearby Haddon Hall, this superb country house is now a marvellous 16-room hotel with gardens leading down to the river Derwent. When first a hotel in 1820, it attracted bathers who plunged in the nearby river Wye. Expect dark wood furniture, taupe or aubergine walls, hunting scenes, portraits of Edwardian actors, subdued lighting and splashes of bright colour. In the bar and restaurant, you’ll see Mouseman furniture. Robert (Mouseman) Thompson was a British furniture maker. His oak furniture features a carved mouse on almost every piece (visit Yorkshire’s Ampleforth Abbey to see more). The staff are friendly and helpful. Small touches stand out. There’s fresh milk for tea in your room, riddles to solve at breakfast, daily walk suggestions and snippets of history about the hotel and the local area. At bedtime, a chocolate on your pillow with the next day’s weather forecast. If your budget doesn’t stretch to a stay, treat yourself to a fine dining experience. The restaurant has been awarded 3 AA rosettes. Dinner starts with an ‘amuse bouche’ such as butternut squash and Parmesan soup served with a pork croquette and apple sauce. And, just when you think you’ve only got room for dessert, you’re presented with an elderflower parfait and raspberry granita ‘pre-dessert’. Guests can enjoy ‘the Golden Age of Dry Fly Fishing’ with a day ticket for fishing in the river Wye for native brown trout. A book in the hotel reception records catches of the day (all fish are returned to the river). Nearby Haddon Hall was used as the setting for the latest screen adaptation of Jane Eyre starring Judy Dench. She stayed at The Peacock while filming, and enjoyed ‘lemon sole with a glass of Champagne’. Guests can visit the Hall at a discounted price. They love dogs here so you can take me too. Their daily walk suggestions will give you plenty of ideas of where to take me.